This is what we hear on a daily basis. Carter yells it when he sees something round. Carter says it when he first wakes up. Carter says it in his sleep. It's basically on repeat.... ball. ball. ball. ball. 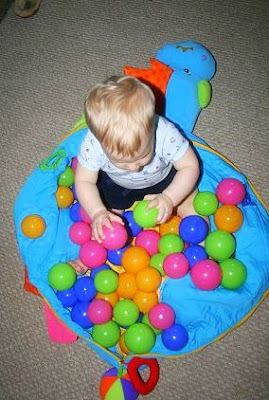 So, logically, the best thing to do is surround him with lots of balls, right? Right. 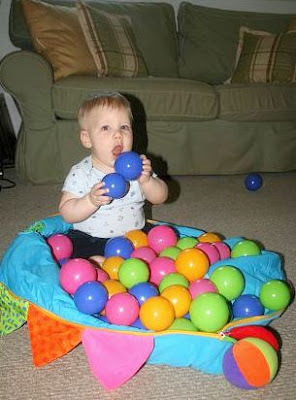 My sweet mother-in-law ordered Carter a new Dinosaur Ball Pit. It came in yesterday and HE LOVES IT. The great thing about this wonderful ball pit, is that it travels! You throw all the balls in it, zip it up, and take it anywhere you want to go. It's also great because you can just throw it in a closet when you are cleaning have visitors and the balls won't fall out everywhere. Sweet. How many of the balls can you fit in your mouth, bud? LOL! I found 4 of the balls under the couch last night! 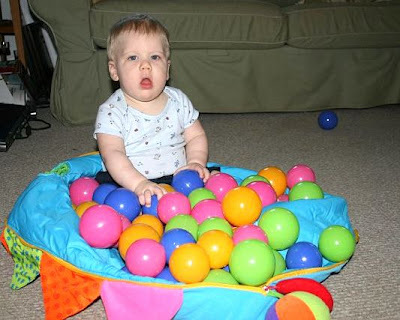 So happy that he is enjoying his ball pit! Do you think we have a Cole Hammels in our future? That is so cute! Do you know where she got it? So cute! Where did she get that?? 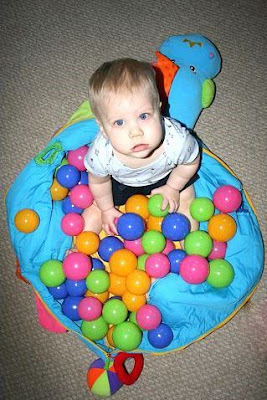 Looks like Carter had a ball with it... no pun intended! Seriously! LOL. Thanks girls! I posted the link above, but it's available on Amazon and a ton of other websites. Click on the amazon link inthe post (where is says "Dinosaur ball pit" in the post) or Google: "Soft Dinosaur Storage/Play Ball Pit by K's Kids"